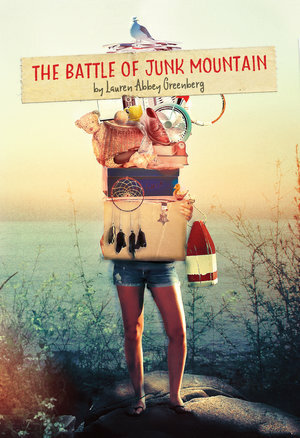 Lauren Abbey Greenberg is the author of The Battle of Junk Mountain, a novel for kids. Her work has appeared in a variety of children's magazines, and she has written and produced videos for National Geographic. She lives in Maryland. Q: How did you come up with the idea for The Battle of Junk Mountain, and for your character Shayne? A: I knew from the beginning I wanted to have a main character return to a beloved summer spot, excited to repeat all the usual rituals and traditions, only to have unexpected change confront her from the minute she gets there. That throws her off balance and she spends much of the novel trying to reclaim the fun of yesteryear. Meanwhile, her grandmother is experiencing problems related to hoarding, and in developing both these characters, I discovered I could use hoarding as a metaphor about the danger of trying to hold on too hard to one’s past. Q: The novel is set in Maine. How important is setting to you in your writing? A: Very important. I find I need to have a strong sense of place before I can begin to sketch out characters. In The Battle of Junk Mountain, the beautiful coast of Maine was chosen as the backdrop because I’ve been vacationing there for over 20 years. Much of the setting is modeled after real-life places and experiences. Q: Did you know how the novel would end before you started writing it, or did you change things around along the way? A: I had a general sense of how it would end. I’m an avid outliner, because I find plotting very difficult. There’s no way I could write without a roadmap to guide me. That said, during revision scenes were added and dropped and darlings killed, but I always stayed true to Shayne’s emotional growth. A: I’m working on another contemporary middle grade although this time it’s set at a bar mitzvah in Maryland during an ice storm. A: I love connecting with kids through school visits! If you’re an educator and you’re interested in an in-person or virtual visit, please contact me through my website.